Does the funding cost differential between peripheral and non-peripheral banks reflect the poor quality of banks’ assets (classic credit risk) or the loss of sovereign support in case of failure (because of the loss of the explicit or implicit guarantee of sovereign bailout)? How do lending conditions in the interbank market interact with monetary policy? Following the euro area sovereign debt crisis, a strand of research has focused on the international transmission of sovereign risk to the real economy through the bank lending channel (Altavilla et al. 2018, Popov and van Horen 2015). The increased riskiness of sovereign debt holdings can lead to a reduction in lending through a tightening of bank funding. In a recent paper (Gabrieli and Labonne 2018), we show that such a tightening was indeed at work in 2011-15, through a higher cost and a reduced availability of interbank liquidity. We find that a credit risk (i.e. exposure-driven) effect was at play besides a pure sovereign-dependence effect. Both GIIPS and non-GIIPS banks suffered from fragmentation risk. The interbank market is an informal market where banks exchange liquidity, mostly uncollateralised and at very short maturities. It allows banks to co-insure against liquidity shocks (as in Allen and Gale 2000) and to minimise the opportunity cost of holding excess reserves. The smooth functioning of this market is crucial for the implementation of monetary policy and for financial stability alike – liquidity tensions have proved to be a powerful channel for the transmission of shocks across borders during recent financial crises. This is particularly true in the euro area because of the importance of cross-border financial flows. Once bank-specific risk is taken into account, access to the market and interbank rates should not differ significantly depending on the location of banks’ headquarters. That is, a well-functioning interbank market should be integrated. Throughout 2011-15, however, banks headquartered in peripheral countries on average paid higher rates (volume-weighted) than non-peripheral banks (see Figure 1). The difference was especially large in December 2011, before the Eurosystem’s first three-year liquidity refinancing operation, and before the August 2012 announcement that the ECB might undertake outright open market operations in secondary government bonds markets. Note: GIIPS = Greece, Ireland, Italy, Portugal, Spain, Cyprus. The vertical lines define three monetary policy periods: Period 1 (Pre-OMT): July 2011 - July 2012; Period 2 (OMT): August 2012 - June 2014; Period 3 (Targeted Long-Term Refinancing Operations, or TLTRO): July 2014 - December 2015. Averages of interest rates are volume-weighted. First, domestic sovereigns are primarily responsible for bailing banks out in case of failure. Bank funding could thus be negatively affected by pure home-country sovereign risk because of the lost guarantee of sovereign support. This is the sovereign-based source of fragmentation. Second, banks are overly exposed to their domestic economy, both via private sector and via sovereign assets. The size and quality of their exposures can increase concerns about counterparty risk and profitability, and hence affect banks’ funding capacity. This is the balance sheet (credit risk) source of fragmentation. Indeed, when contagion is very likely, as in 2011-15, lenders in the interbank market could react to country risk rather than to idiosyncratic counterparty risk. To disentangle the two sources of fragmentation, we combine lender-borrower (bank-to-bank) unsecured loan data estimated from TARGET2 payments1 in 2011-15 with detailed supervisory information disclosed since 2011 by the European Banking Authority (EBA) on the capital positions and exposures of 115 European banks.2 For each loan, we observe the lending and the borrowing bank, the date, volume, and interest rate of the loan. Through EBA data, we observe the cross-border and cross-sector (sovereign, corporate, retail) composition of banks’ exposures. We use this information to construct several measures of each bank’s GIIPS-related credit risk. Through this unique dataset, we can study the impact of sovereign and balance sheet risk, as measured by the size and quality of exposures to GIIPS, on the probability of finding a lender in the interbank market and on loan interest rates. We test the predictions of a simple model of participation in the interbank market which takes into account the interaction between interbank lending and central bank liquidity provision. We expect interbank rates (access) to increase (decrease) in a bank individual default probability and in the probability of default of its sovereign. Before the ECB’s announcement of Outright Monetary Transactions (OMT) on sovereign debt securities, we expect interbank rates (market access) to increase (decrease) the larger the size of, and the riskier, the bank exposures to GIIPS assets. After the OMT, we expect lenders to revaluate the riskiness of GIIPS assets. This could alleviate balance sheet-based and sovereign-based fragmentation alike. Empirically, we disentangle the two potential channels for fragmentation by comparing borrowing conditions across GIIPS and non-GIIPS (e.g. Finnish, German, or French) banks. We look at the effect of the size and quality of their GIIPS exposures on interbank lending terms, after taking into account other bank-specific risk characteristics (size, rating, and capital ratio) and country-specific risk factors (e.g. sovereign CDS). We make sure that the effects are not driven by changes in borrower demand or by other shocks to banks’ balance sheets. Furthermore, we estimate our model on the sample of non-GIIPS banks only (64 out of a total of 115 European banks represented in the EBA sample) to get a neater separation of the effect due to large exposures to GIIPS assets from the effect due to the dependence to a risky sovereign. Throughout the period of the analysis, between 80% and 90% of non-GIIPS banks are exposed to GIIPS countries, mostly through sovereign asset holdings. Our analysis shows that banks headquartered in GIIPS countries are not the only ones to suffer from interbank fragmentation. Non-GIIPS banks exposed to GIIPS suffer as well, and the larger and the riskier their GIIPS exposures, the more they suffer. These effects vary through time. First, we find that, all other things equal, high non-performing loan (NPL) ratios on GIIPS assets hindered access of non-peripheral banks to the interbank market during the entire sample period. Higher NPL ratios on GIIPS assets decreased the probability of finding a lender. Second, from mid-2011 until the OMT, a non-peripheral bank paid more for interbank loans the larger its exposures to GIIPS sovereigns. Specifically, an increase in the share of GIIPS sovereign exposures by 1 percentage point raised interest rate spreads by 1.3 basis points. This represents 13% of the average spread paid by non-GIIPS borrowers in this period. Third, the OMT was successful in closing this channel of sovereign risk transmission. 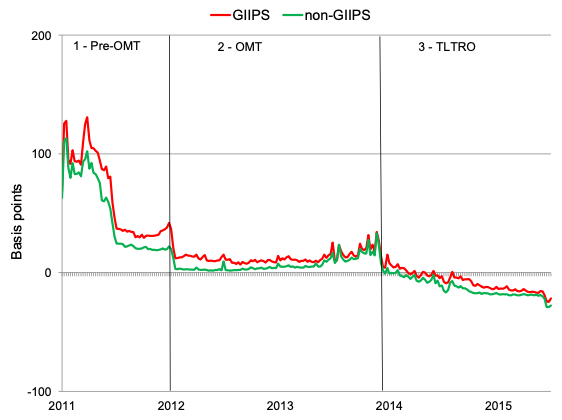 That is, after the OMT announcement, we find no significant differences in interbank rates depending on banks’ exposures to GIIPS. Moreover, the selection effect due to high NPL on GIIPS assets, while still significant, becomes much weaker. Regarding sovereign-dependence risk, while before the OMT we measure positive home-country risk premia in interbank spreads (e.g. for Spanish, Italian, and French banks), these premia fall and even turn to discounts afterwards (see Figure 2). After the OMT, when we observe fragmentation, it is mainly driven by idiosyncratic balance sheet risk. Note: Home country risk premia are average country trends in interbank spreads computed from interest rate estimations (from the borrower-country fixed effects interacted with time). They provide information on pure home country sovereign risk of the borrowers. More details about the computation of the risk premia and their time series plots (including confidence intervals) are available in the paper. Overall, the OMT affected both sources of fragmentation – it reduced the country premia paid by GIIPS borrowers, but it also affected lenders’ pricing of counterparty credit risk. Authors’ note: The views expressed in this column are those of the authors only and do not necessarily reflect the views of the Eurosystem, the Banque de France, the Federal Reserve Bank of Boston or other parts of the Federal Reserve System. Allen, F and D Gale (2000), “Financial contagion ”, Journal of Political Economy 108(1): 1–33. Altavilla, C, M Pagano, and S Simonelli (2018), “Bank Exposures and Sovereign Stress Transmission,” Review of Finance 22(3). Farhi, E and J Tirole (2018), “Deadly Embrace: Sovereign and Financial Balance Sheets Doom Loops ”, Review of Economic Studies 85(3): 1781–1823. Gabrieli, S and C Labonne (2018), “Bad Sovereign or Bad Balance Sheets? 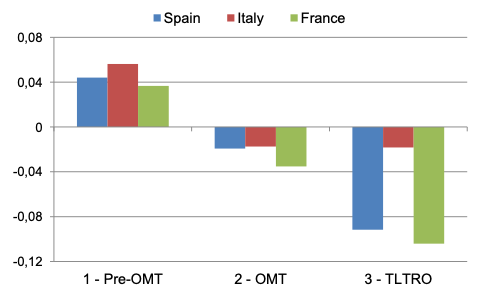 Euro Interbank Market Fragmentation and Monetary Policy, 2011-15 ”, Federal Reserve Bank of Boston Working paper No. 18-3 (also available as Banque de France Working paper No. 687). Popov, A and N van Horen (2015), “Exporting Sovereign Stress: Evidence from Syndicated Bank Lending during the Euro Area Sovereign Debt Crisis,” Review of Finance 19(5): 1825–1866. TARGET2 is the European large value payment system, owned and managed by the Eurosystem. The identification of interbank loans consists in matching two transactions (payments) between say bank A and bank B: a “send” transaction whereby A provides the agreed loan amount to B and a “refund” transaction whereby B reimburses A of the loan, paying a certain interest rate on the notional amount received. These “send” and “refund” transactions between euro area banks are mainly settled via TARGET2. Information about supervisory data disclosed by the EBA in stress test and transparency exercises can be found on the EBA webpage https://www.eba.europa.eu/risk-analysis-and-data . For more details about the datasets, see Gabrieli and Labonne (2018).